You could be forgiven for thinking this newly released picture is a snap shot from Margaret Thatcher’s reign as Prime Minister. But the uncanny likeness is actually Oscar-winning actress Meryl Streep, set to play the former PM in new flick, The Iron Lady. SEE MORE DRAMATIC MOVIE MAKEOVERS HERE! The political biopic – rumoured to hit screens later this year – is being overseen by Mamma Mia! Director, Phyllida Lloyd, and also stars Brit actor Jim Broadbent, as Margaret’s husband, Dennis Thatcher. Production is said to have started on the flick last month, and Meryl is seriously excited about getting stuck into the challenging role. ‘The prospect of exploring the swathe cut through history by this remarkable woman is a daunting and exciting challenge,’ she revealed earlier today. 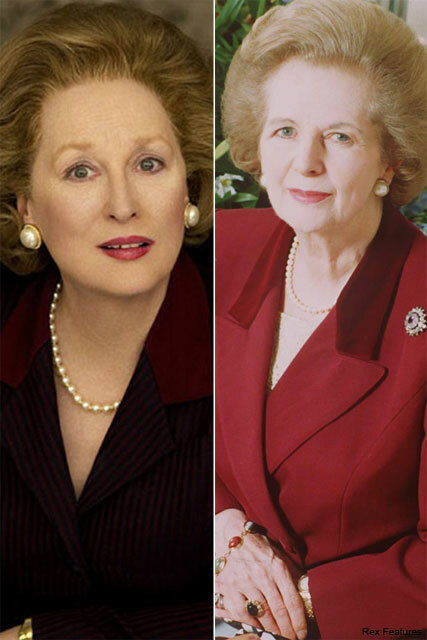 ‘I am trying to approach the role with as much zeal, fervour and attention to detail as the real Lady Thatcher possesses – I can only hope my stamina will begin to approach her own,’ Meryl added of the film, which will document the struggles faced by the Baroness, during her rise to power. Will Meryl Streep make a good Margaret Thatcher? Or would someone else have been better suited to the role? Let us know in the comments box below.